Jewish Food Experience®: What is the state for farm animals in Israel? Adit Romano: Despite being a small country, there are still hundreds of thousands of animals slaughtered annually here. They are raised on industrial farms—not on pretty green pastures. Animals face cruel and inhumane conditions, such as cramped spaces, cruel removal of body parts and killing “unusable” animals. There are 250,000,000 dairy cows in the world and 120,000 in Israel. They’re treated like machines, expected to simply produce vast amounts of milk, unable to move, care for calves or enjoy life without producing milk. Israelis eat an average of 238 eggs per person per year. Female chicks are raised on egg farms, where, due to decades of genetic manipulation and selective breeding, they produce 250 to 300 eggs per year. In nature, wild hens lay only 10 to 15 eggs annually. Israel slaughters about 200,000 pigs, and another 70,000 are killed before the date of slaughter due to various diseases, most of them piglets. JFE®: Tell me about how you developed the idea for Freedom Farm. AR: After I became vegan, I was very restless and eager to make an impact. I spent 20 years as an entrepreneur and felt I needed to start something that would generate significant change. While searching online, I found the US-based Woodstock Farm Sanctuary. In one of the photos I saw a group of teenagers next to the animals and then I realized, that change can only come from education. Meital [Ben Ari, my co-founder] and I embarked on a journey to establish the farm as an educational center for all Israelis. JFE®: What is the status of Freedom Farm now? AR: There were a lot of bureaucratic difficulties in starting up a project like this in Israel, and we’ve worked for two years to reach this point. In the state of Israel, over 90 percent of the land is owned by the government, and areas that are considered agricultural are highly inspected and not all activities are allowed on them. Establishing an animal sanctuary was unprecedented because all other farms were simply to raise animals for food. We did finally acquire land and have also adopted several animals that were destined for slaughter. Meital went for a month to learn and study animal care at a US farm sanctuary. We are part of an international sanctuary farm forum and we consult and learn from each other’s experience there. We are focused on getting more animals, building infrastructure now at the sanctuary and fundraising. JFE®: What are your long-term goals for the farm? AR: We believe that knowledge is power. We hope to be able to impact future generations to be kinder, more moral, seeking justice, with their hearts open to giving and to empathy with the pain of the other. We encounter animals in supermarkets, wrapped in Styrofoam and shrink-wrap, far from their original form and identity, and have no way of looking in their eyes and sympathizing with their pain. Anyone entering the Sanctuary will not leave the same, nor will they remain indifferent about changing old and unnecessary habits, to replace them with renewed values. We want to flex the muscle of compassion, one existing in all of us—for us and for them. This proximity will give us all a new, exciting and intriguing viewpoint on animals as sophisticated social structures, their basic needs and even their desires and pain, their characters and forgotten feelings and that each is a unique and special being. JFE®: Why do you think veganism and animal welfare issues have become so popular in Israel? AR: As of 2014, in Israel five percent of the population is vegan and eight percent is vegetarian. A wave of veganism started in the 2010s with the lecture of the American activist Gary Yourofsky, which spread through Israeli websites and social media. There were also a number of documentaries and hidden-camera footage, which made public and revealed the abuse on animals, in dairies, slaughterhouses and factories in Israel. The increasing vegan population led to the opening of several 100-percent-vegan restaurants. In 2014 an animal activist, Tal Gilboa, won the sixth season of the reality show Big Brother. During the show Tal represented the vegan stand and significantly affected the people who watched the show. Many relate her winning to the increasing admiration for the vegan lifestyle, and Tal pledged a significant amount of her prize to Freedom Farm Sanctuary. In 2014 due to the increase of the vegan lifestyle in Israel, the Israel Defense Forces made a few accommodations for vegan soldiers, such as easing the process as being recognized as a vegan soldier, providing money to buy vegan food and giving vegan clothes (non-leather shoes and vegan caps). JFE®: What have been the most inspiring moments in your journey so far, and what have been the hardest? 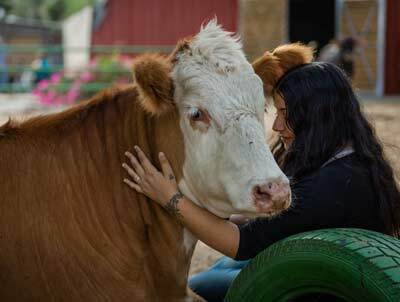 AR: The journey to opening the Freedom Farm Sanctuary has been full of emotions, from happiness to disappointment, from sadness to hope. For me, one of the most exciting and inspiring moments has been meeting the volunteers of the farm. I like to say that the Freedom Farm Sanctuary is like a huge magnet that pulls all the kindest people, without the volunteers none of this would have happened. One powerful moment was the day we were called to get Eden, a dairy farm calf. It was a mix of emotions: on the one hand, it was pure joy to save a calf’s life and get her out from hellish life on a factory farm. On the other hand, we saw so many, big wide-eyed cows looking at us, none of whom we could take with us. It was hard to turn our backs and leave these miserable animals there, knowing what will happen to them. Kol haakvod to Adit Romano for this wonderful, pioneering effort. As president emeritus of Jewish Veg (formerly Jewish Vegetarians of North America) and author of three editions of the book, “Judaism and Vegetarianism,” and over 250 articles, mainly on vegetarianism/veganism, and related issues, at http://www.JewishVeg.com/schwartz, I commend her greatly. It is past time for Jews to realise that vegan diets are most consistent with Jewish mandates to preserve human health, treat animals with compassion, protect the environment, conserve natural resources, help hungry people, and pursue peace. I saw your lovely comment on the JFE site in support of our work at Freedom Farm Sanctuary. Thank you for your support. As an expert in Judaism and animal welfare, I would love to speak to you about your background and the sanctuary. Additionally, please let me know if you would like to visit the farm. How can one volunteer here? Please contact Freedom Farm through their contact form here. Good luck! I’m so sad about the animals you can’t save…what can people do here in the US or for the animals in Israel to help save as many as possible?